12,000 flee the rumbling Mayon volcano in the Philippines as eruption now imminent according to government officials. More than 12,000 people have been ordered to evacuate from a seven-kilometre (four mile) danger zone around the crater, as officials warned them of potentially destructive mudflows and toxic clouds. 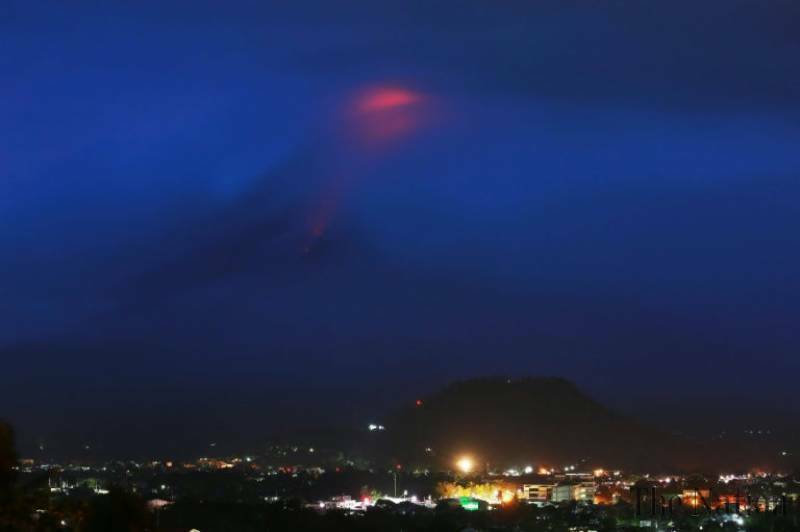 The crater of a rumbling Philippine volcano was glowing bright red Monday, with vulcanologists warning it could erupt within days, sending thousands fleeing from their homes. Volcanic earthquakes and rockfalls have shaken the summit of Mayon over the last 24 hours, after a number of steam-driven eruptions, scientists said according to NDTV. T exaggerate the problem continuous heavy rains recently could lead to volcanic mudflows (lahar flows). The Philippine Institute of Volcanology and Seismology (Phivolcs) raised Mayon Volcano's alert status to Alert Level 3 - which means it has an increased tendency towards eruption - at 8 p.m. Sunday, less than 24 hours after Alert Level 2 (increasing unrest) was raised here. Ed Laguerta, Phivolcs Bicol chief, said that they were still unable to determine the distance of the lava flow because of the clouds. But the brighter crater glow is an indication of lava. "The brighter glow of the crater is an indication of the initiation of the lava flow on the southern slope of the volcano." "So I can keep AN EYE on THINGS, while I'm in prison.